You can afford anything, but not everything. We make daily decisions and create habits around how to spend money, time, energy, focus and attention – and ultimately, our life. Every decision is a trade-off against another choice. But how deeply do we contemplate these choices? Are we settling for the default mode? Or are we ruthlessly optimizing around a deliberate life? Are we creating financial independence, early retirement and debt freedom? Are we managing money wisely? 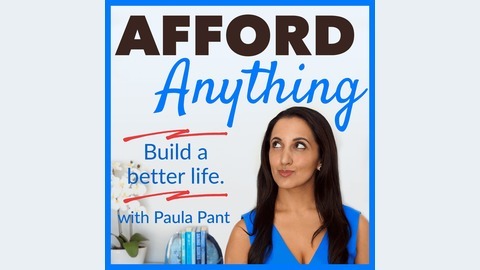 Host Paula Pant interviews a diverse array of entrepreneurs, early retirees, millionaires, investors, artists, adventurers, scientists, psychologists, productivity experts, world travelers and regular people, exploring the tough work of living a truly excellent life. Listen to her interviews with Clark Howard, Gretchen Rubin, Cal Newport, James Clear, Chris Guillebeau and Dave Ramsey daughter Rachel Cruze. Want to learn more? Download our free book, Escape, at http://affordanything.com/escape. 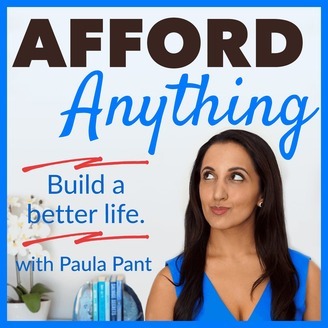 #189: Julie, age 27, calculated her expected net worth based on the formula taught in the classic personal finance book The Millionaire Next Door. She’s concerned. Her current net worth is significantly lower than the number that the formula revealed. Is she on-track? Anonymous wants to save for a downpayment on a home. Should she reduce her 401k contributions in order to amass these savings? Should she store some of that money in a Roth IRA? Samantha is more than halfway finished with paying off her debt. In order to make this happen, she took on a second job. How much will she owe in taxes? Maxime works at a job in which his 401k only offers expensive choices. Should he put his money in a taxable brokerage account, instead? Leslie’s parents are going to retire in five years, but they’ve only saved $65,000. What should they do? How can she help? Claire is creating an estate plan. What should she be thinking about? Former financial planner Joe Saul-Sehy and I answer these six questions in today’s episode. Ask Paula: How Do I Talk to Friends who Ridicule the Idea of FIRE?